Generally, it is a bullish continuation pattern, but a breakout in each direction is possible. If you like taking risk, you can go long immediately after you spot this pattern. But if you want to be careful, it is recommended to wait until breakout appears in either side. The most important parts of the ascending triangle are the horizontal line and the upwardly sloping line. It is also important for the price rate to touch each of those lines at least twice before the breakout materializes. This rule is vital for all of the five Forex chart patterns presented in this article. As you can see on the image, the price has touched the sloping line three times and the horizontal line two times, and then broke out through the latter. Stop-loss should be placed slightly below the horizontal line. As a moderate pull-back is possible, consider placing stop loss near 70% level on the way from the sloping line to the horizontal at the time of the breakout. Take-profit should be placed according to the auxiliary sloping line, which runs from triangle's top-left angle parallel to the main sloping line. Consider placing your target at the auxiliary line's level at the time of the breakout. A descending triangle is a bearish continuation pattern, but a breakout in each direction is possible. As with the previous pattern, you can go short immediately after you spot it. Wait for breakout in either side to enter a high-probability trade. 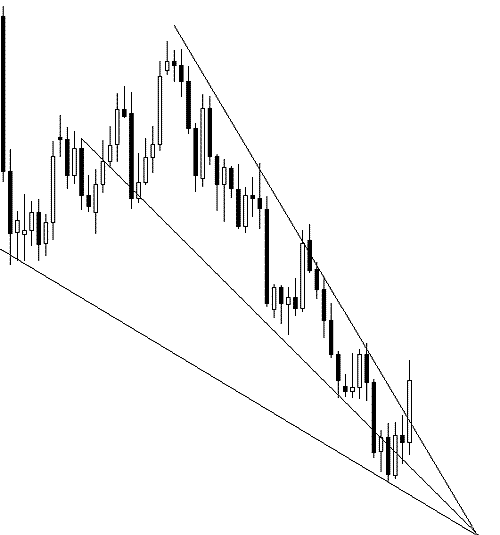 The most important parts of a descending triangle are the horizontal line and the downwardly sloping line. 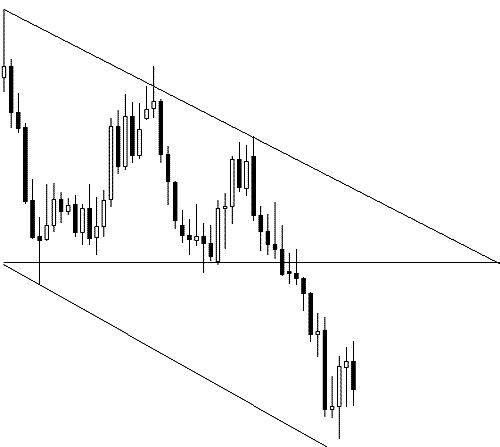 The price rate should touch each of those lines at least twice before the breakout occurs. As the image shows, the price has touched the sloping line three times and the horizontal line two times, and then broke out down. Stop-loss and take-profit levels are placed using the same principles as with the ascending triangle. Same as with two other triangles, it is a continuation pattern that breaks out in the direction of the previous trend. However, in practice, a breakout in every direction is possible. As always, you may decide to open a position in the direction of the previous trend immediately when you spot this triangle. If you wait for the breakout to occur, then you will have better chances for success. The most important parts of the symmetrical triangle are the downwardly and upwardly sloping lines and the horizontal line that bisects the angle created by the first two lines. The last line should be really horizontal (some degrees of error are OK) or otherwise it is some kind of a wedge but not a symmetrical triangle. 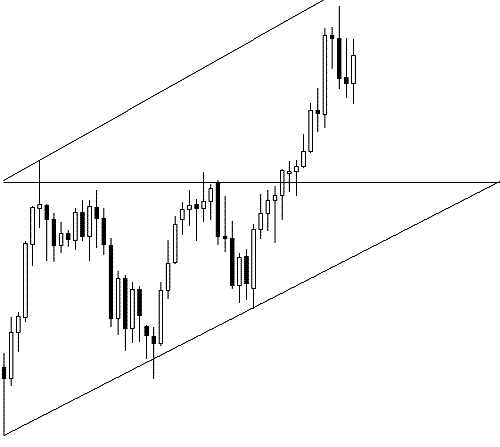 As always, the price should touch each of the main sloping lines at least twice before the breakout happens. The symmetrical triangle, which is shown on the image, breaks out downwardly after touching the bottom line three times and the top line multiple times. Stop-loss should be placed near 70% level on the way from the opposite sloping line to the horizontal line in the basement of the triangle (not the breakout point like before). Take-profit can be set near the auxiliary horizontal line, which runs from the top or bottom base angle (depends on the breakout direction) of the triangle and is parallel to the main horizontal line. Usually, this chart pattern signals a reversal from the previous trend, but both upward and downward breakouts are possible. 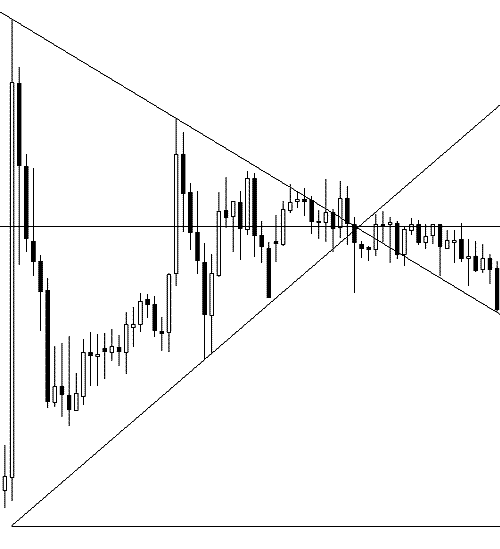 You can enter a risky trade immediately when you see this pattern. Wait for a clear breakout to enter a more probable trade. The crucial parts of the rising wedge are the two upwardly sloped lines that form a wedge. The price should touch each of them at least twice before the breakout occurs. On the image below, you can see that the price touched the top line two times and the bottom line multiple times. The downward breakout is shown. Stop-loss can be set at the auxiliary line that bisects the angle of wedge; set it near the level of the auxiliary line at the time of the breakout. Take-profit is set near the auxiliary line (not shown on the image) that runs from the top or bottom base angle (depending on the breakout direction) of the wedge and is parallel to the opposite sloping line. E.g., in the pictured example wedge, the line should start at the bottom angle of the wedge and be parallel to the top sloping line. Take-profit should be placed near the level of that auxiliary line at the time of the breakout. As its rising cousin, this chart pattern often signals a reversal from the previous trend, but both upward and downward breakouts are still possible. 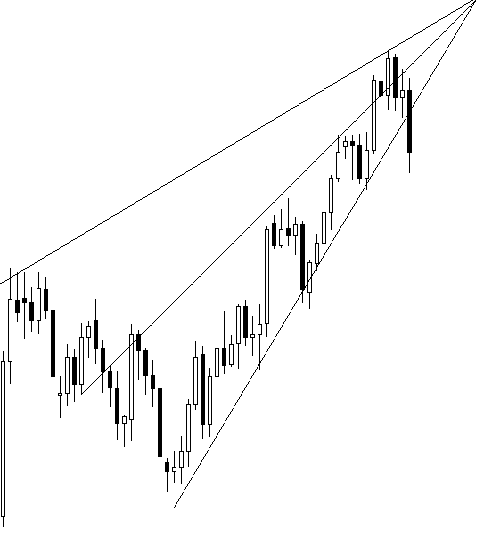 To enter a risky trade, open it as soon as you see this chart pattern. Wait for a clear breakout to enter a more probable trade. The main parts of the falling wedge are two downwardly sloped lines that form a wedge. The price should touch each of them at least twice before the breakout. On the image you can see that the price touched the bottom line two times and the top line multiple times. The upward breakout is shown. Stop-loss and take-profit levels are set using the same principles as with the rising wedge.